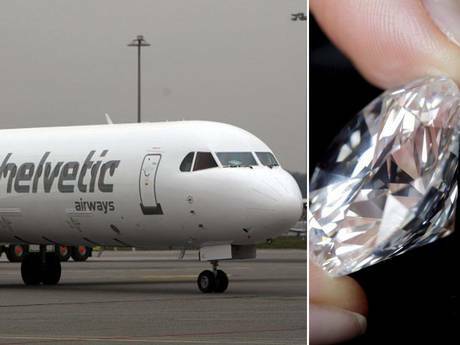 Armed robbers have made off with a “gigantic” haul of diamonds after a rapid raid at Brussels Airport. They broke through a fence on Monday evening and stole gems which could be worth 50 million euros ($67 million), as they were being loaded from a Brinks security van onto a Swiss-bound plane. They escaped back through the same hole. Police later found a burned-out vehicle close to the airport. Police are looking for eight men, a prosecutors’ spokeswoman said. AFP quoted an unnamed spokeswoman at the same Antwerp centre calling the robbery “one of the biggest” ever. She said that the diamonds were “rough stones” being transported from Antwerp to Zurich. Antwerp is the hub of the world diamond trade – about 150 million euros’ worth of stones move in and out of the city every day, the spokeswoman added. Brussels prosecutor’s spokeswoman Anja Bijnens said the thieves were masked and well armed, but no shots were fired and no-one was hurt in the raid. They used two vehicles, the raid was over in a matter of minutes, and they made off into the night. An airport spokesman, Jan Van Der Crujsse, said the robbers made a hole in the perimeter fence and drove up next to the Swiss passenger plane that was preparing to leave. He could not explain the security breach. “We abide by the most stringent rules,” he said.